BEIRUT, Dec 28, (RTRS): Buses and ambulances evacuated about 450 Islamist fighters and civilians from two rebel-held areas besieged by Syrian government forces and carried them across into Turkey and Lebanon on Monday, sources at the border crossings said. The evacuations took place under a United Nations-sponsored agreement, part of efforts by the UN to set up local deals on cease-fires and safe passage as stepping stones towards a wider peace accord in Syria’s civil war. 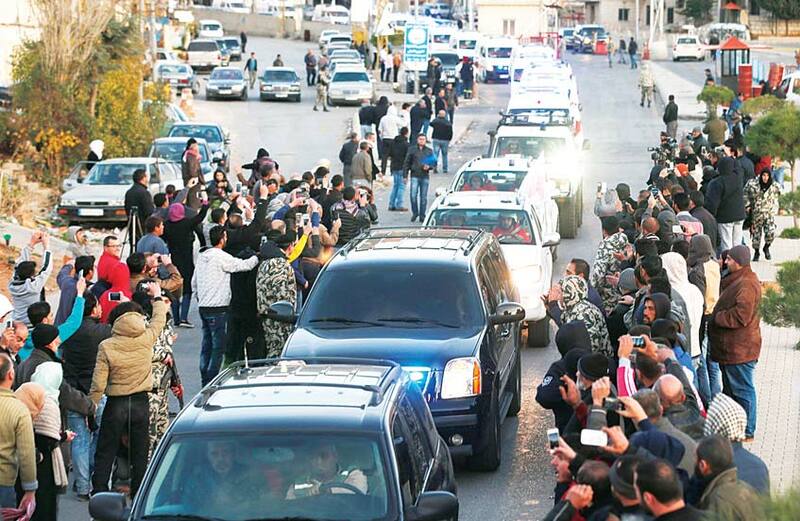 More than 125 fighters from the besieged rebel-held town of Zabadani near the border with Lebanon were en route to Beirut airport to board a plane to Turkey. Simultaneously, around 330 civilians and wounded fighters trapped in two pro-government Shi’ite villages in Idlib, northwest Syria, were heading to the Turkish city of Hatay to take a plane to Beirut, aid workers said. In return for allowing the rebels to leave, the deal allows the government of President Bashar al-Assad to restore control over areas that had been in rebel hands for the past four years. In Zabadani, a once popular resort city now in ruins, relief workers and rebel fighters who have been holed up for months helped carry several wounded young men in wheelchairs onto ambulances. Relatives and well-wishers who had waited for hours on the Lebanese border cheered buses carrying the fighters as they drove by towards Beirut airport, and some families wept as they strained for glimpses of their loved ones, a witness said. Zabadani, northwest of the capital Damascus, was one of the rebels’ last strongholds along the border. Much of the town was devastated in a major offensive launched in July against the insurgents by the Syrian army and its Lebanese Hezbollah allies. Only several hundred rebels remain in the town, where most civilians have fled to nearby Madaya. The evacuation deal was the most significant of several localised truces to date, involving months of mediation among warring parties. The UN’s Syria mediator aims to convene peace talks in Geneva on Jan 25 in the latest effort to end nearly five years of civil war in which more than 250,000 people have died. Iran, which backs Assad’s government, and Turkey, which backs the rebels, helped organise local cease-fires in Zabadani and the two villages in Idlib in September in the first phase of the deal, overseen by the International Committee of the Red Cross. The mostly Sunni Muslim rebel fighters going to Turkey from Zabadani would then be able to go back to rebelheld areas in Syria through the northern Turkish border or stay for treatment, according to rebel sources close to the negotiations. The Shi’ite Syrians leaving the besieged towns in the north where at least 25,000 civilians still live would be able to get to Lebanon, where Hezbollah would be able to watch over them, added the sources. They are then expected to go back to other parts of Syria, Syrian Minister of National Reconciliation Ali Haider said on Hezbollah’s Manar TV station on Monday. ‘Abu Rateb’ leader of Syrian rebel group killed – Dead men still own weapons?